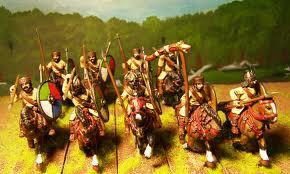 When it came to gathering intelligence for the Roman army, the exploratores and the speculatores were the units most often used. Although each unit had specific duties, their jobs did tend to overlap from time to time. Exploratores were generally used to gain information through the use of patrols at a distance from the enemy, whereas speculatores most often acquired enemy intelligence through undercover operations (Evov, 81). Both positions were important to the Roman army when it came to battle strategy and to provide protection from enemies when not in combat. As previously mentioned, exploratores gathered information concerning the enemy by patrolling the areas around hostiles. When sent on a mission, their objectives were to provide the captain with details of enemy movement and activity. Also, they were to relay information regarding the conditions of the terrain and any strong or weak points within. They usually patrolled about a day ahead of the main army unit, constantly on the lookout for enemies and potential ambush sites (Ezov, 75). Aside from patrolling, they were used to verify information obtained from prisoners taken from the enemy or deserters. In addition to their previous duties, they were often selected to locate a camp site to be used by the army for a period of time. When choosing a site, they had a few factors to keep in mind: size of the army, location, and security from the enemy (Caesar, 2- 17). The exploratore unit originated from the cavalry; it already had the great advantage of mobility. The typical soldier assigned to this unit would generally be native to the area due to his knowledge of the terrain. To this day, we still have little evidence regarding the size and organization of an exploratore unit; they were thought to be relatively small in size and because there was no official ranking for them, by default, they were under a centurion (Ezov, 79). Athough the picture below contains models, it is assumed that this is how the exploratore units functioned. They traveled in small groups and on horses to remain highly maneuverable and quick. In addition to the use of exploratores for reconnaissance missions, Caesar also used speculatores. Although they did have similar jobs, speculatores usually gathered information by working in disguise and spying on the enemy (Ezov, 80). Exploratores and speculatores both collected information about hostiles, but only speculatores were ever referred to as spies. Gathering intelligence regarding the enemy was their main duty, but in addition, they patrolled like exploratores, although they were usually involved guarding important people (Wikipedia). Parallel to the situation of exploratores, we have little evidence to the size and organization of these units. Due to the particular missions of these men, conclusions can be drawn that most likely the units contained few men, if not alone, on a mission (Ezov, 83). Caesar, J. (1994) The Gallic Wars (trans. W.A. McDevitte and W.S. Bohn.). Ezov, A. (1996). The “missing dimension” of c. julius caesar. Historia: Zeitschrift für Alte Geschichte, 45(1), 64-94. Richmond, J. (1998). Spies in ancient greece. Greece & Rome, 45(1), 1-18.